I saw your works online and I'm thinking of doing a caricature of my fiance and I for our wedding on 22nd May at Singapore Art Museum. I would like to find out how much time do you need to do a caricature? I am thinking of including the caricature in our wedding invite but I'm not sure if you would be able to get it done in time. I will need it by end of this month, probably 31 March if not latest 3 April. 1) I hope to include the caricature in my invite therefore i will need a digital copy of the artwork. The original artwork i intend to put it up at the entrance of the Glass Hall. 2) I have attached photos of us in our wedding outfits. 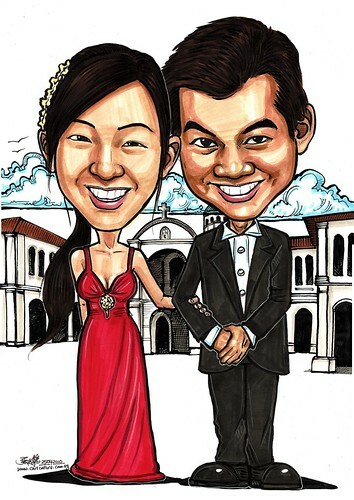 (sharon.jpg and james.jpg) Could you do a caricature of us standing in front of the Singapore Art Museum in our wedding outfits, with us standing side and side, and me hooking his hand? (refer to pose.jpg) Please give me curls for my hair at the side :) The photo was taken before the curls were done...."
Too 'engrossed" with the mix-and-match of details (hairstyle) + posture required, I missed out on the white gown required by the client. Thank goodness the client is forgiving.